I can’t believe how long it’s been since I have posted a recipe and I am so sorry about that, we’ve moved house so things have been insanely busy. I finally feel as though I have a small amount of time to myself, but that is more often that not spent thinking about all the work I have to do for work, family and sorting out all our stuff! That’s the life of a Mum I guess. Anyway all is good in our world and spring is almost on our doorstep. Not withstanding another winter blast for us Melburnians! That means Magnolia’s are flowing, the blossoms are blooming and Lemons are bountiful. What will you do with all those lemons? Preserve them of course! They are an essential ingredient to all Moroccan food and add a certain something which I don’t think can be replicated by anything else. A big glass jar, preferably one with one of those clip lids and a rubber ring to seal, but a metal or glass lid will work as well. As many thick skinned lemons as you can lay your hands on. What to do… Wash the lemons and remove the storks. Slice them into quarters, but not all the way through, you need to leave them intact although that said if you need to slice them all the way in half so they’re packed more tightly into the jar then go for it. Pack them tightly into the jar and I mean TIGHT, squash them down really well, you need to make sure that when you add the water they don’t rise up and become uncovered by the water. If you have any of those plastic lids that covers a baby’s bottle then you can use them to keep the lemons submerged. Once the lemons are in place add salt and enough water to cover. As a rough guide I would add 3/4 to 1 cup of salt to a jar that would hold about 2 litres of water if it was empty. Seal the jar and stick in a dark cupboard for at least a month or two. You can also pack them into smaller jars and use them for Christmas presents, the only thing you need to be aware of is to ensure the lemons are submerged under water so they don’t come in contact with any metal surfaces in the lid. When it comes time to use them again no need to remove the flesh unless you were using the rind in a salad, just make sure you rinse them and don’t be alarmed if there is a funny jelly like substance that rinses away, it’s normal. Also on occasion you do get a layer of mould on the lemons, I think this happens for a few reasons, firstly the jar isn’t sterile and the lemons aren’t completely submerged. The lemons at the bottom should be okay to use. This is what we had for dinner tonight and it was sensational if I do say so myself! I’ve come to the conclusion that the best way to ensure you get the delicious caramalisation at the end is to watch it for the last 10 or so minutes, or as we did tonight get everyone around the table – dished up the kids serves – then put it back on the heat to reduce the liquid to almost nothing. The benefits are almost mind blowing, you go from a great meal to a sensational and memorable meal but really the best way to get that is to be there watching it so it doesn’t burn. Trust me it’s worth it however painful it might be, you won’t regret it. Add a lug of olive oil into your cast iron pan (one with a lid) and saute, add the chops and sprinkle over half the cumin, paprika and some salt & pepper, brown the chops and turn once, then add the carrots and put the chops on top of them, arrange the fennel over the chops (you may need to cut them into eighths, it just depends on how large they are to begin with). Sprinkle the remaining spices and chopped parsley over the fennel and add about a cup of water. You want to not quite cover the chops. By this time the tajine should almost be at the boil, cover with a tight fitting lid and turn the heat down so it’s just simmering and cook for about an hour, keep checking it though. 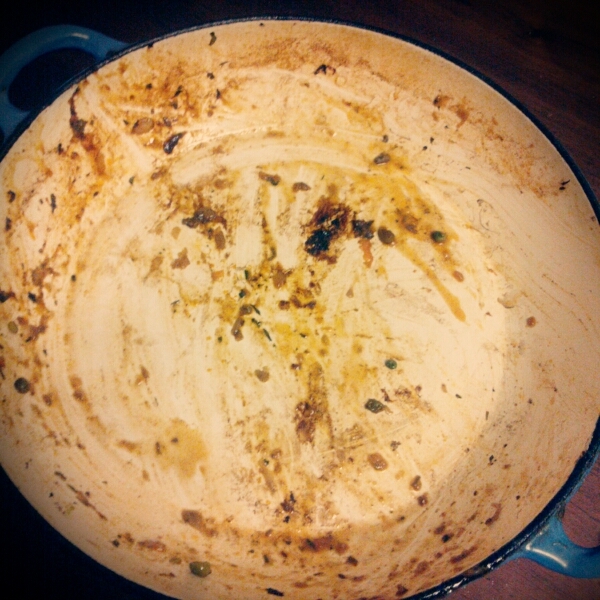 About 15 minutes before you think it’ll be ready add the peas, scatter them all over the tajine and cover again. Tonight I turned ours off about 10 mins before I wanted to serve it, thinking it’s ready, I know that the cast iron pan hold it’s heat and I didn’t want it to burn. Hubby says (and he was right damn it) that there was still too much water, so we took out some for the kids and put it back on the heat for another 5 or so mins on high to really reduce the water, I kept tilting the pan so we could see what was left liquid wise and we were left with a sensational meal! 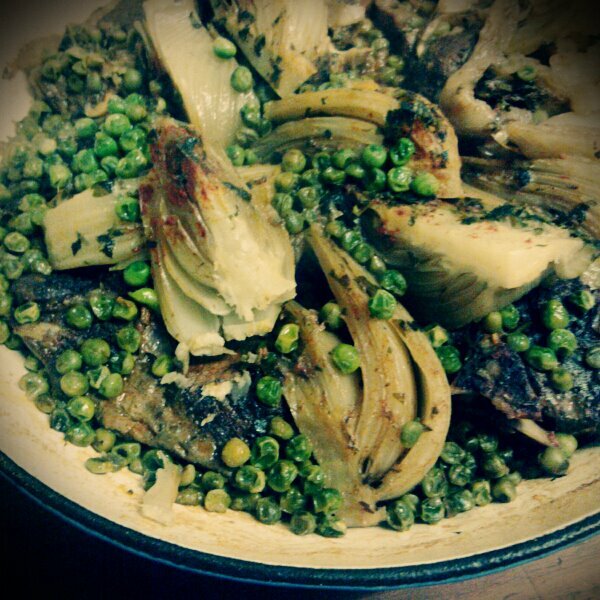 You can use any vegetables you like for this one from fennel & Peas, Carrots & Cauliflower or Peas & Artichokes, as a guide the recipe below would serve 4 people depending on how hungry everyone is. Take a large cast iron saucepan and saute the onions with spices, herbs, garlic & olive oil for 3 minutes, add the chops and seal, take the chops out, put the carrots on top of the onions, put the chops back in a single layer where possible. Put the slices of potato on top of the chops, season with a little pepper, slice the tomato in half and place in the middle of the stack with the preserved lemon, pour in 150mls of water, cover and allow to gently simmer for at least an hour, longer if possible. You want to end up with lightly caramillised carrots and a thickish sauce, don’t add salt until the end as the preserved lemons will add salt to the dish, also you can always add more water if required but the tomato will release it’s juices and you therefore shouldn’t need much more. Serve with crusty bread and a salad if required. So cutting right to the chase, these are very simple and lovely gifts to give for Christmas, when you’re invited for dinner or keep for yourself, they’re quite simple & easy to make, you just need to ensure your bottles are clean & sterilised and slightly warm before you fill them. Wash the lemon thoroughly and remove the rind with a potato peeler, ensuring there is no pith on the rind, warm the olive oil to 180 degrees with the lemon rind in the pan. Allow to cook slightly and pour into a bottle or jar. Allow to steep for a week, then drain to remove the rind and re bottle. Keep in a cool dark place. Wash the stalks of the basil & place into a saucepan with the cloves of garlic & parmesan rind, add the olive oil & bring to 180 degrees, allow to steep and when it’s cooled slightly pour into a large jar and place in a dark cupboard, leave for a week. Then drain and re bottle into sterilised bottles. 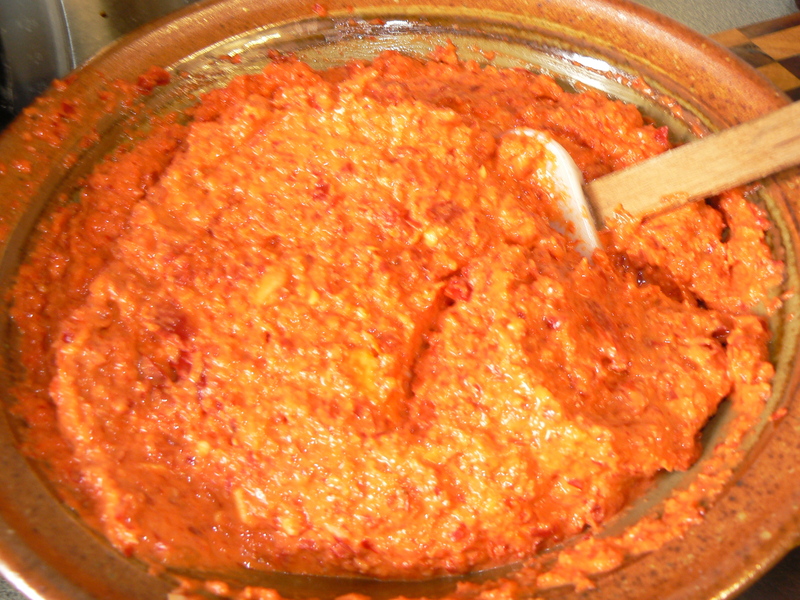 This is a tear inducing chilli paste that’s native to Morocco, so of course it’s well loved in our house, but not by me, because I don’t do chilli, at least not with this much punch. 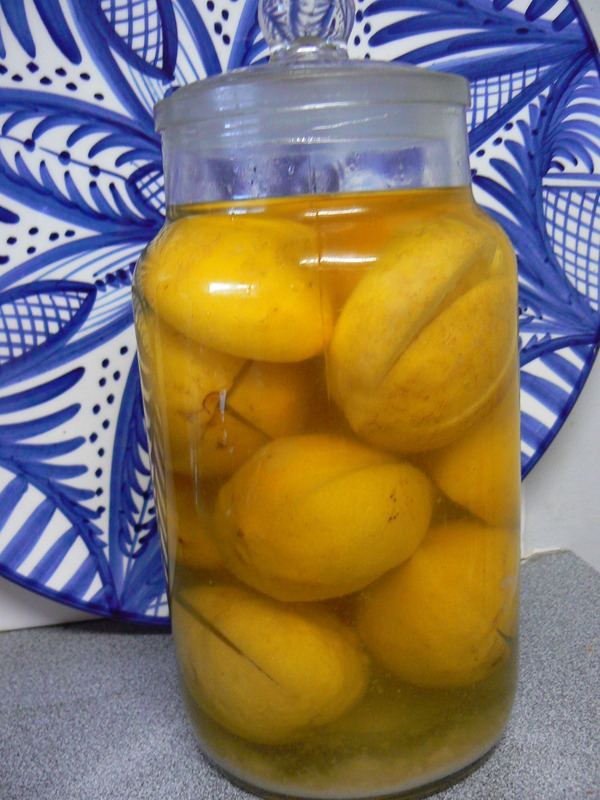 You will need preserved lemons to make this so if you haven’t already had a go at making them either buy some, or get on it and a month or so you will be able to make the harissa. I would recommend you wear rubber gloves before you start this. Remove the stalks from the chillies, if you want to you can remove the seeds as well, but it’s not necessary, do bear in mind though that with the seeds it’s going to be even more potent. Peel the garlic & rinse the 2 preserve lemons, in the bowl of a food processor place all the ingredients except for the olive oil. Puree until the ingredients begin to combine, start pouring in the olive oil, you want a chunky consistency, not completely smooth, taste for seasoning, although you shouldn’t need any extra salt as the preserved lemons should have enough residual salt. 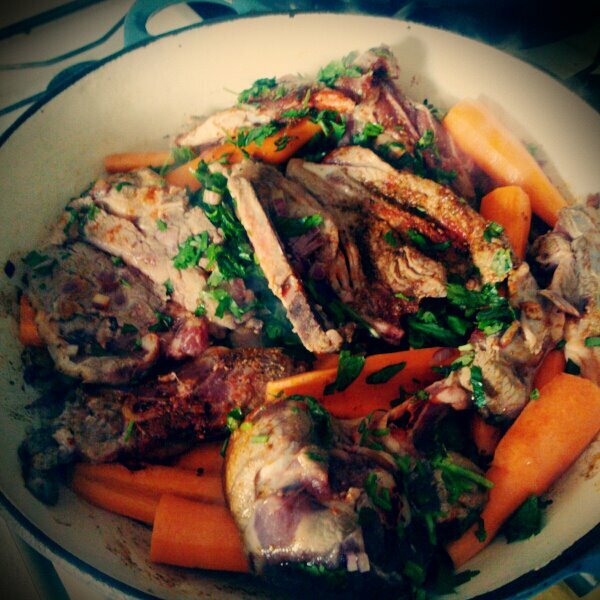 Add at least a heaped Tablespoon of ground Cumin at this stage. Place into small sterilised jars & cover with a layer of Olive Oil, store in the refrigerator & use in moderation unless you want your socks knocked off! 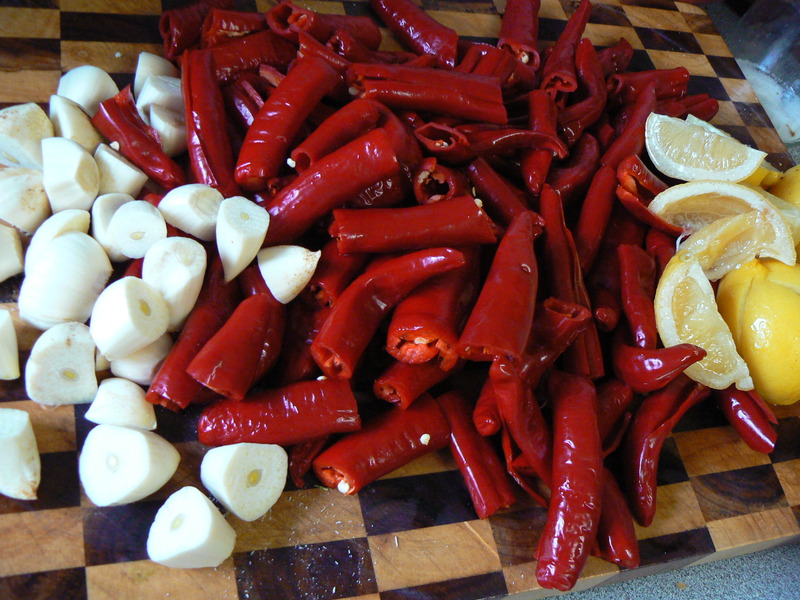 Serve with bread, your tajines, as part of an antipasto platter or as a dip. Place the onions & spices in the base of your tajine or a cast iron pan. Add the chops and allow to brown slightly. Remove chops and place the sliced carrots on top of the onions, then layer the chops on top. 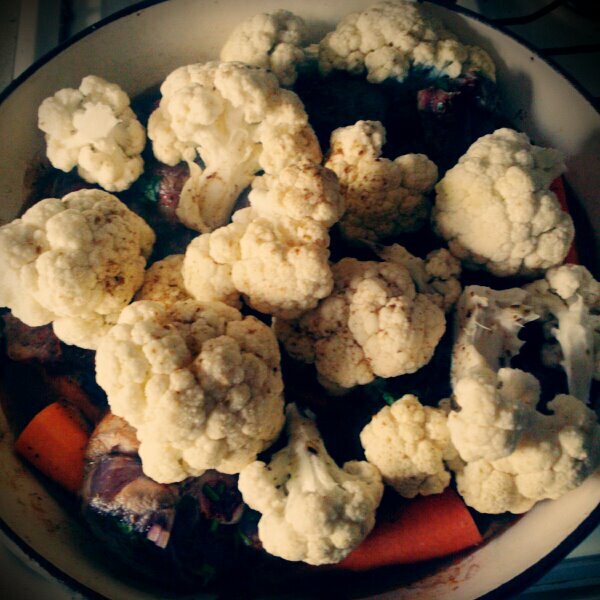 Cut the cauliflower into small flowerets and lay over the top of the chops, place the tomato on top, pour in the water and sprinkle a little extra, salt, cumin & paprika over the cauliflower. Cover and bring to a gentle simmer. Leave to cook slower for at least 2 hours or until almost all the water has evaporated. If you’re using a cast iron pan then you may need to add a little extra water and keep an eye on it as it seems to get hotter & hold the heat for longer than a tajine. Serve with crusty bread & a garden salad or greens. P.S. I was NEVER a fan of cauliflower but this has completely changed my mind, I even ate it by it’s self… no white sauce in sight!